Amarr garage doors are available in a wide range of styles, designs, and colors. When you choose Action Garage Door Repair Specialists for your next garage door, our experts can help you choose the right Amarr door for your home or business. These doors offer safety, energy efficiency, durability, and style, making them a well-known choice for those looking for a residential or commercial garage door. From the stylish look of Amarr’s Classica doors to the traditional appeal of Amarr’s Stratford doors, you can find the ideal door to suit your home or business. All of Amarr’s doors are made from high-quality material and feature exceptional craftsmanship. The Amarr garage door company has been building residential and commercial garage doors since 1951. The company has gained a reputation for designing and manufacturing stylish doors that offer a high degree of safety. In recent years, Amarr garage doors have also started providing improved energy efficiency, which helps homeowners and business owners save on energy costs. Some of Amarr’s doors also include SafeGuard Pinch Protection for added safety and a reduced risk of injuries. The residential and commercial steel and aluminum doors the company makes are manufactured in the U.S. and feature as much as 90 percent recycled content. Whether you go with Amarr’s Classica, Heritage or Stratford garage door for your home, you can count on having an exceptional quality product that will last for years. All of Amarr’s doors have a long lifespan thanks to high manufacturing standards and the use of quality materials during production. Our garage door experts can help you go through your options and choose the best door for your residential or commercial building. Although Amarr garage doors are made to last for many years, they can develop problems that require repairs. The experts at Action Garage Door Repair Specialists have the knowledge and experience needed for providing reliable Amarr garage door repair in the Dallas, Fort Worth, Houston, Austin and San Antonio areas. Whether you end up with a broken garage door spring, a bent track or a broken cable, our team will have it repaired as quickly as possible, so you can continue using your garage door safely. If your Amarr door isn’t working properly and you aren’t sure what’s wrong, our experts can examine it for you and determine what the problem is. Having a reliable Amarr garage door that operates safely is important in order to reduce the risk of injuries. When your garage door is not working the way it should, give the experts at Action Garage Door Repair Specialists a call, and we’ll handle it for you. Amarr commercial garage doors are made with the highest quality steel, aluminum and other materials for optimal durability. When you invest in an Amarr commercial door for your business, you’ll be getting a product that will operate with maximum safety and last for a number of years. At Action Garage Door Repair Specialists, we carry several types of commercial garage doors made by Amarr, including steel sectional doors, aluminum sectional doors, rolling steel doors and rolling sheet doors. These doors are also available in varying strengths to best suit the needs of your business. Whether you need a polyurethane insulated door, polystyrene insulated door, ribbed panel or aluminum full view, our experts can help you select the right Amarr commercial garage door for your building. We know how important it is to make sure you choose a garage door that offers the strength you need and the style you want for your business. With help from our experts, your commercial garage will have an Amarr door that enhances its appearance while also providing the functionality you need. 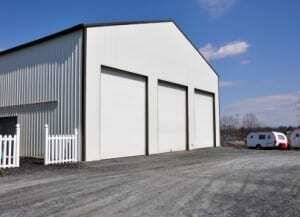 In many commercial ventures, purchasing appropriate overhead doors is an important aspect of initial building costs. Warehouses, storage facilities, auto shops, and other industries depend on reliable and secure Amarr overhead doors to meet their business’s demands. Action Garage Door is committed to providing top-quality service. This includes installing Amarr products when and where you need them or simply helping you find your Amarr garage door manual. You never need to worry about our ability to do the job right. As a family-owned company, we understand the value of your business and the communities we serve. Amarr products are built to stand the wear and tear of commercial use. Not only do Amarr overhead doors need to be able to function many times nearly every day, but they also must withstand extreme weather conditions. Amarr doors can meet your most stringent requirements in all significant areas. The first method you should use when narrowing down a large selection of commercial doors to the model that would work best for your business is to know what demands you will place on the door. You can find Amarr doors designed for constant use, or that are built to work even after months or years of disuse. Whether you need substantial insulation, many window, few windows, or superior strength, Amarr has a door to fit the bill. We can help you choose from a wide range of excellent products in addition to offering our superior installation services. Action Garage Doors is happy to help you choose the right Amarr overhead doors for your property. To make an appointment or ask about our services, contact us or call one of our Texas offices.